Antrim Hockey Club minis, pictured with co-ordinator Johnny McMeekin and assistants Adam Morrison and Jason Roe. With the work due to begin on the new astro pitch at Antrim Forum, the popularity of hockey is certainly going from strength to strength within the town. This is due, in no small part to Antrim Hockey Club’s enhanced Youth Coaching and Development Programme which has been stepped up in recent years. 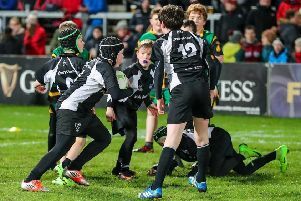 Whilst the established Friday afternoon and mid week sessions for older primary school and secondary school-age children remain popular, the relatively new ‘Minis Coaching Programme’ has really taken off. Saturday mornings see throngs of 4-7 year old children (and parents) gather at the Forum for an exciting new initiative for younger children. Course co-ordinator and coach, Johnny McMeekin, along with Tommy Monahan and Andy Gleghorne feel that the new, fun, age appropriate hockey programme for this demographic heralds a new era for the Club, and for the town. These new developments, along with links to local schools and the imminent new astro pitch facility will ensure that Antrim along with Randalstown Ladies Hockey Club, will retain their their historical reputations.